A total solar eclipse is arguably the most beautiful natural phenomenon in the sky. Occurring on average every 14 months, it gives an immediate view of the mysterious-looking shape of the Sun’s upper atmosphere, known as the corona, and many other wonderful, but often hidden solar features. An eclipse happens due to the precise sizes and distances of our Moon and the Sun, and their periodic dance with the Earth. The tilt of the lunar orbit with respect to the apparent path of the Sun during a year only allows the Moon to align directly in line with the Earth and the Sun every six lunar cycles, and fully block the disk of the Sun from Earth’s perspective every fourteen lunar cycles. Among the many types of solar eclipses, total eclipses are the most dramatic and beautiful. The type of eclipse and its duration also depend on the precision of the alignment and distances of the Sun and the Moon relative to the Earth. More information about the geometry of the solar eclipses can be found here. 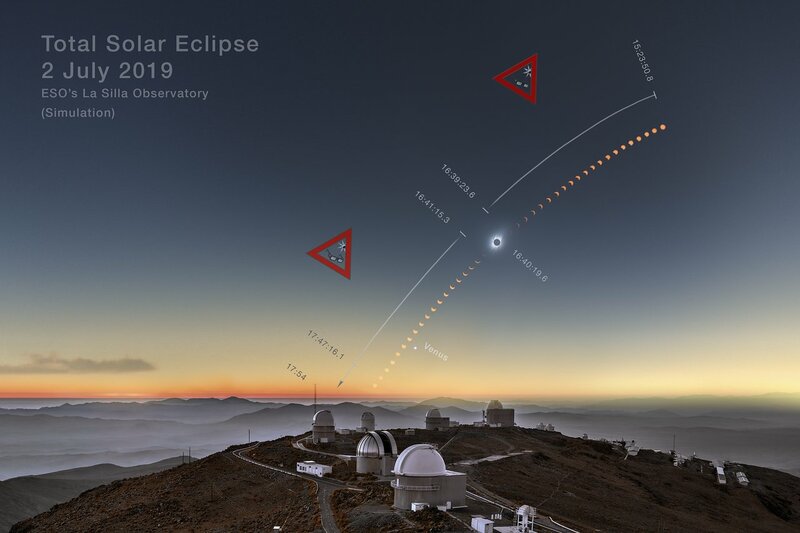 The 2019 total solar eclipse will last about 1 minute and 48 seconds from the La Silla summit. The Sun will be setting just as the entire eclipse ends and the peak of totality will happen when the Sun is a mere 13 degrees above the horizon from the view of La Silla Observatory. In addition to the beautiful colours in the sky that accompany the time before sunset, the Sun’s low angle means the lunar shadow could create a unique “U-shape” in the atmosphere. This shape only happens when the eclipse happens low to the horizon. 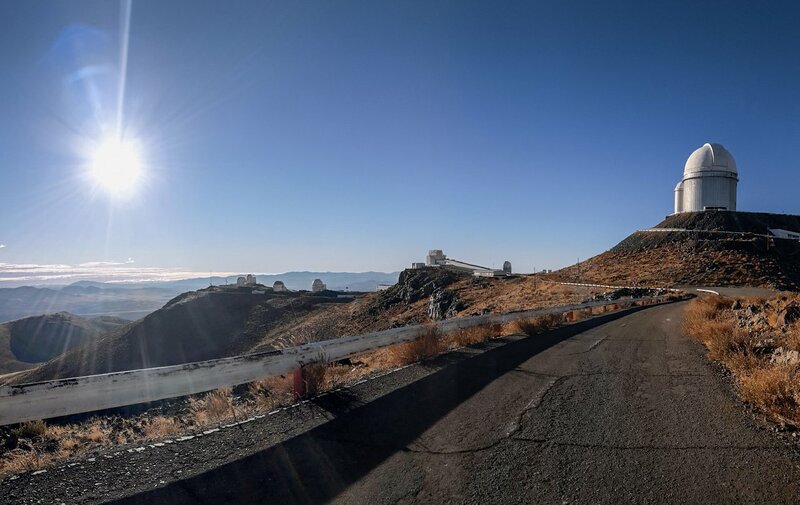 The 2019 total solar eclipse will also be visible from the Cerro Tololo Inter-American Observatory and the Cerro Pachón Observatory. 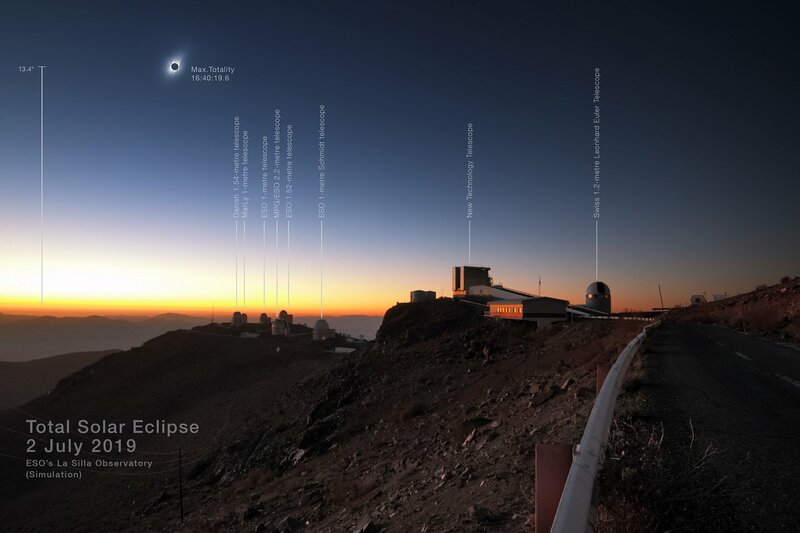 In addition, Las Campanas Observatory which lies just outside the path of totality, will see a partial solar eclipse. Solar eclipses are more than a breathtaking show of nature, as they also provide opportunities for scientific experiments. A total solar eclipse allowed Sir Frank Watson Dyson and Sir Arthur Eddington to prove that massive objects bend light according to Einstein’s general theory of relativity. This event, known as the Eddington Expedition, celebrates its 100th anniversary in 2019. Today, researchers can study the physics of the upper solar atmosphere and changes in the places affected by the eclipse using the best digital and astronomical instruments. 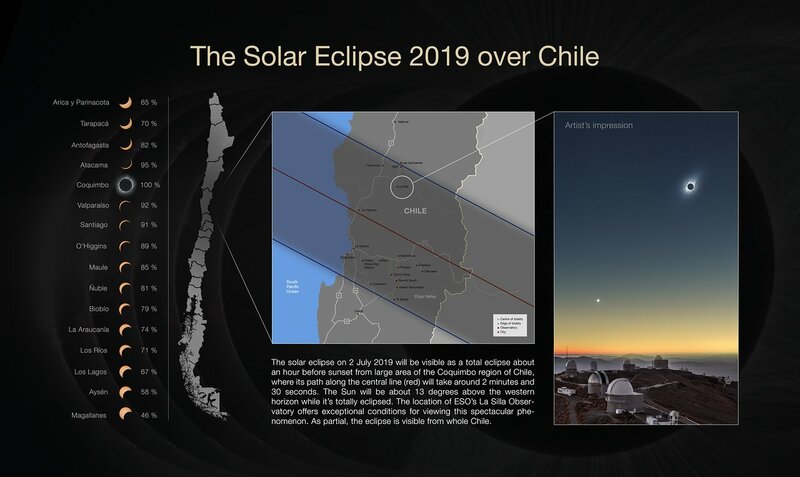 In addition to coinciding with the anniversary of the 1919 Eddington expedition, the eclipse takes place during the 50th anniversary of the La Silla Observatory and the 100th anniversary of the International Astronomical Union. 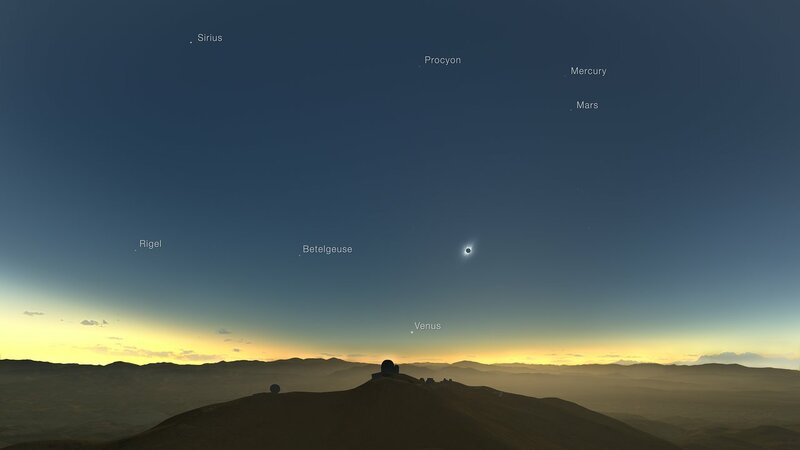 This clear-weather simulation shows how the eclipsed Sun would look like in the sky above La Silla on 2 July 2019 if the weather is clear. Credit: ESO/J. Morin, M. Druckmüller, P. Aniol, K. Delcourte, P. Horálek, L. Calçada, M. Zamani.